← Can foliar diseases in forage grasses cause economic losses for livestock producers? Does Your Corn Have Northern Corn Leaf Blight? The silver lining of most disasters is that they are often accompanied by opportunities to learn something new or at least be reminded of something already known. The down side is that disasters are often very expensive in the short-term. 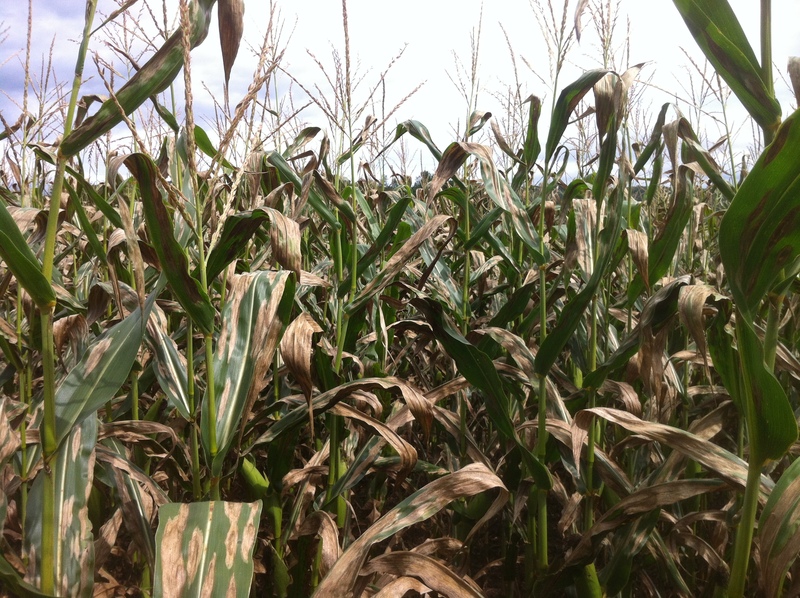 The disaster of the day is northern corn leaf blight (NCLB), a fungal disease that in some circumstances can decimate corn yield and silage quality. Northern corn leaf blight has been observed at varying levels of severity in Vermont for the past several years. This year some fields along the Connecticut River (and probably elsewhere) will probably suffer 30% yield losses from this disease. Much of this loss will result from poor grain fill stemming from the reduction of photosynthetic area on the affected leaves, which will also have implications for silage quality. Cigar-shaped lesions on the leaves of a plant infected by northern corn leaf blight. Northern corn leaf blight is most easily recognized by the ½ – 1” wide by 1-7” long ‘cigar-shaped’ lesions that form on the leaves. In severe infestations, the lesions can be prolific enough that they eventually join at the edges and may turn the entire leaf a grayish brown color. The earlier this foliar disease occurs in the growing season, the greater the yield (and quality) impact will be. Yield losses can be as high as 50% if the disease becomes established prior to tasseling. To make matters worse, fields with severe infestations are often more susceptible to stalk rot. The NCLB inoculum can be deposited on the growing crop from distant fields via rain or wind, but infection will be more severe if inoculum is present in the field. Corn grain farmers have had NCLB on their radar for a long time because the pathogen overwinters in the abundant corn residue which is characteristic of that cropping system. 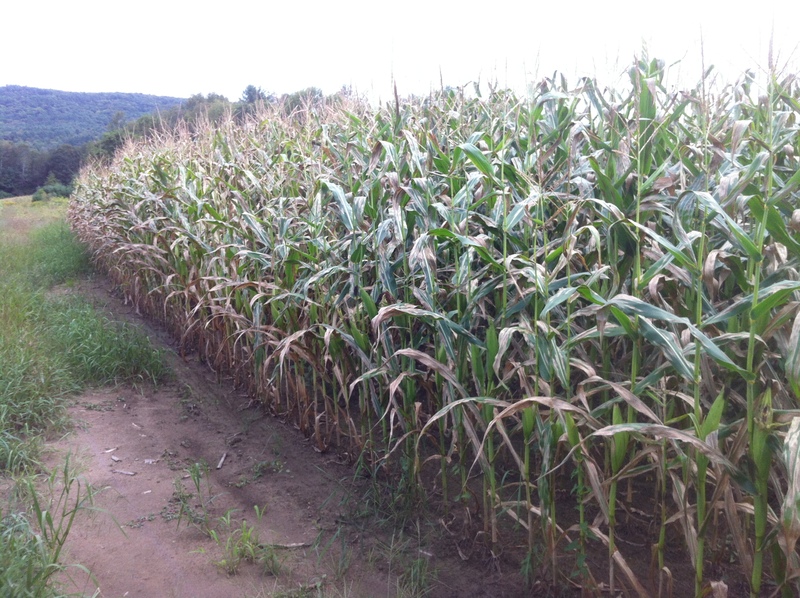 Corn silage systems typically have fewer problems with NCLB because of the scarcity of residue remaining after harvest. characteristics that favor extended leaf wetness (6 – 18 hours per day). For example, river bottoms with frequent fog, sheltered areas with reduced air movement, shade. Be aware that the scales used to rate disease resistance may vary among seed companies. Pioneer and Mycogen, for example, have a scale of 1-9, with a rating of 9 indicating excellent resistance; DeKalb’s scale is opposite, and a rating of 9 indicates poor resistance. The variety planted in a local river-bottom field with a severe NCLB infestation had a rating of ‘4’ on the Pioneer/Mycogen scale. This 106-day hybrid was planted in the adjacent field and had a NCLB resistance rating of ‘6’ (a rating of ‘9’ indicates the highest level of resistance). The difference in condition between the fields is probably only partially due to genetics. There are two forms of NCLB resistance that exist in commercial cultivars: partial and race-specific. The ‘partial’ resistance gives the plants some degree of resistance to all races of NCLB. In areas where NCLB is a common problem, producers and their seed representatives can work together to choose hybrids that are resistant to the local NCLB race that is known to be most problematic. Yellow lesions often still appear on resistant varieties, but they are small and do not result in the production of spores. Other management options include crop rotation and fungicides. Scouting for NCLB should occur just prior to tassel emergence. If the disease is beginning to develop at that stage and the forecast and other risk factors indicate that an infestation is likely to occur, a fungicide application may reduce the impact of the disease. When warranted, the greatest economic returns will be realized when fungicides are applied between tasseling and early silking. There are no established economic thresholds for fungicide applications in corn. In conventional tillage systems, rotation away from corn for one year greatly reduces the likelihood that NCLB will develop in the subsequent corn crop. In no-till systems, a two-year break is advisable. Northern corn leaf blight can be easily confused with other diseases such as Stewart’s bacterial wilt and Diplodia leaf streak. Contact your local Extension agronomist or Certified Crop Advisor for assistance with a diagnosis. Daniel Hudson can be contacted by e-mail at daniel.hudson@uvm.edu or by phone: 802-751-8307. Darby, H. Northern Corn Leaf Blight. 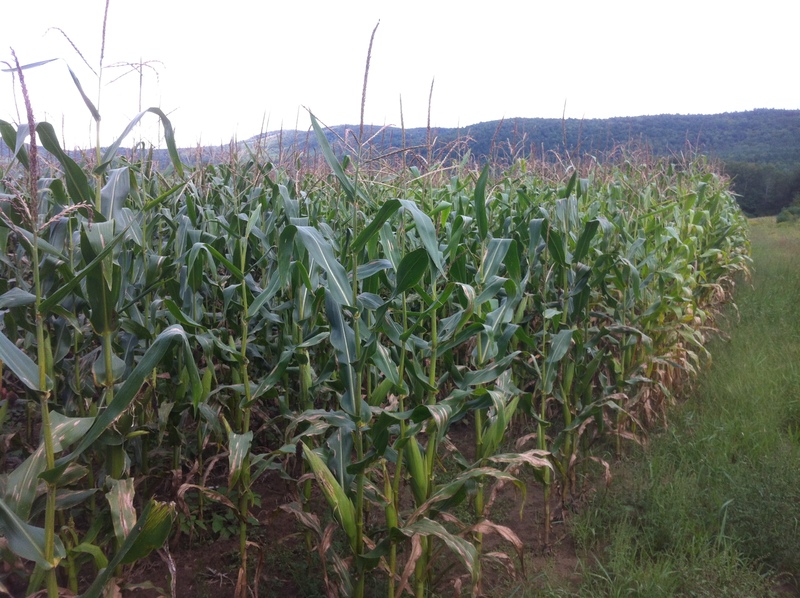 Online: http://www.uvm.edu/extension/cropsoil/northern-corn-leaf-blight University of Vermont Extension. Accessed September 2013. Dillon, P. Northern Corn Leaf Blight (NCLB). Online: http://ohioline.osu.edu/ac-fact/pdf/0020.pdf University of Kentucky Extension. Accessed September 2013. Lipps, P.E., and D. Mills. Extension Fact Sheet: Northern Corn Leaf Blight. Online: http://www.extension.purdue.edu/extmedia/BP/BP-84-W.pdf Ohio State University Extension. Accessed September 2013. Wise, K. Diseases of Corn: Northern Corn Leaf Blight. 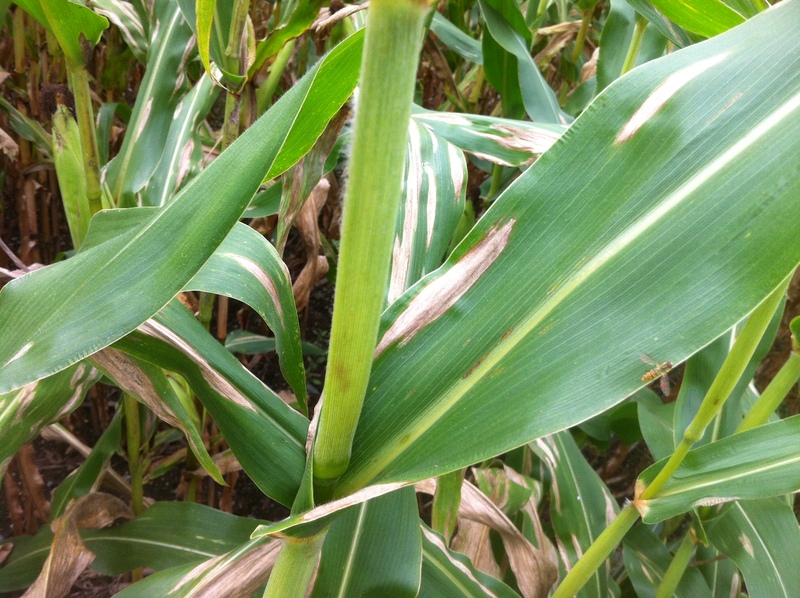 Online: http://www.uky.edu/Ag/IPM/scoutinfo/corn/disease/nclb/nclb1.htm Purdue University Extension. Accessed September 2013.